At full capacity, Froedtert Hospital was in need of a hospice wing. Without undertaking a large, costly project, their non-profit affiliate, Horizon Home Care stepped in and presented a new solution and approach to hospice care. 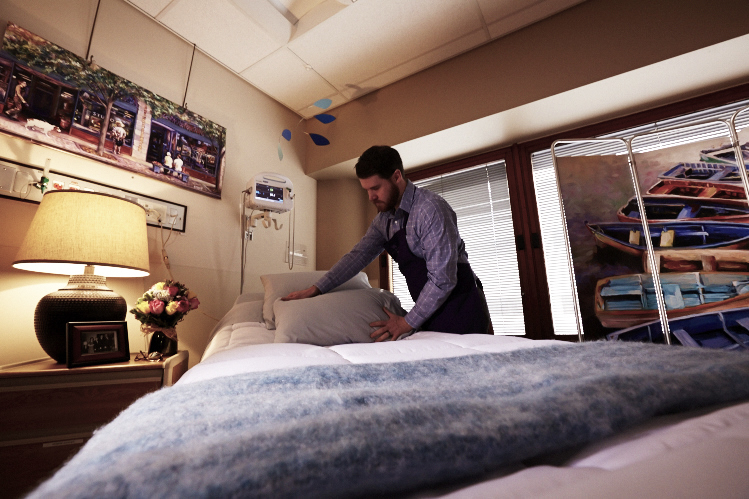 GROTH Design Group's mission was to develop concepts that could be temporarily implemented, allowing for a standard hospital room to be converted to a hospice room, all within one hour and by volunteer staff. Incorporating elements that touched all senses, a soothing home-like environment was created. After the room is no longer required for hospice care, the temporary elements are removed and it becomes a standard room once again. After months of testing products and installation methods, to prevent interference with any existing equipment that was required to stay within rooms and comply with all building codes, a trial room was installed successfully.